Our journey started over 12 years back at Bhimtal (Nainital Distt. Uttarakhand, North India) in a very humble way. Over the years we have endeavored to provide our guests with the most friendly experiences and have redefined family holidays to a vast majority of our privileged guests over then years. The accommodations are categorized into two variants, Single Rooms and Double Rooms. Spacious and well appointed accommodation with amenities like a well stocked mini bar, cable television, room heater, spring mattress and down feather quilts, a modern attached bathroom with supply of hot and cold water. 24 hour room services and STD/ISD telephone are among the conveniences offered. An ideal place to unwind while you pamper yourself in the serene surroundings, customized cuisines and friendly services. We strive to make every single guest feel at home and passionately work towards achieving the same. An ideal place to unwind while you pamper yourself in the serene surroundings, customized cuisines and friendly services. 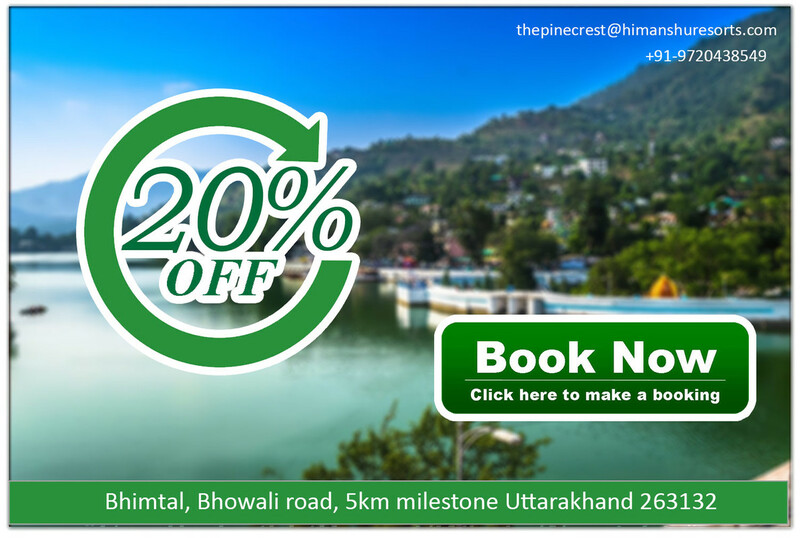 Laid across beautifully landscaped gardens, The Pine Crest Bhimtal is a harmonious blend of the facilities one expects of a luxury resort surrounded by the thrills of the Himalayan slopes. From discovering yourself as you leisurely walk amongst the brilliant flowers in our gardens, to a dedicated activity area for kids, we have put together all the requisites to make the resort an absolute family holiday destination. Our efforts have brought us the “ The Best Resort in Bhimtal” award by Trip Adviser and is a dedicated to our 'Guests'. Our journey started over 12 years back at Bhimtal (Nainital Distt. Uttarakhand, North India) in a very humble way. Over the years we have endeavored to provide our guests with the most friendly experiences and have redefined family holidays to a vast majority of our privileged guests over the years. We strive to make every single guest feel at home and passionately work towards achieving the same. At our resort we have put a lot of emphasis on enhancing the natural beauty of the premises and assure you of an environment, high on natural elements. We welcome you to our resort where you are assured of the finest holiday moments! ABOUT BHIMTAL Bhimtal is a picturesque beautiful town in the most beautiful hill station and tourist place of Uttarakhand – Nainital. Located at an altitude of 1370 meter above seas level, the town is by Himalayan slopes, lakes, natural greenery and tranquility that every tourist wish to enjoy. Moreover, this wonderful tourist place in Uttarakhand is also known for its amazing vistas and cool climate. During your holidays in the beautiful town, you will also see some fascinated tourist places. I stayed two nights at the Pine Crest. The food in the restaurant was good (I had Indian dishes), the breakfast could improve a bit. The room was nice and clean and I especially liked the garden. Wifi was only available at the reception and sometimes very slow. The staff was helpful and friendly. As the main road is just below the resort, it can be a tad noisy sometimes. rooms were not up to mark. bathrooms were big but not very convenient. AC n Hot water facility was there.Room service was ok. Service staff was not enough. Food was ok for a hill station.They need to redo their rooms.chopping of trees in front of window is required for a better view of valley. Went for lunch to their only restaurant, Italiana. found that its not just for Italian food but its a multi-cuisine restaurant. We tried a couple of their Italian dishes though. The Fussilli Con Pollo - turned out to be quite tasty, though the pasta could have been cooked for a couple of minutes more. We had a look at one of their rooms - neat, well ventilated, quite spacious double bed with a en suite modern toilet.